The countdown is on….2 weeks from tomorrow I will be hopping on a plane and jetting off to Mexico! It’ll be my first time going and I’m so excited to have a week away with my manfriend and his family. Sunshine, mango trees, tacos, and relaxation. This vacation couldn’t come at a more perfect time. It’s been a pretty stressful couple of weeks couple of months year for me, and while I haven’t felt more stressed lately than I usually am, my eye twitch that hasn’t gone away for two weeks tells me otherwise. However, I’d like to think all things considered I’m handling the stress pretty well (with the exception of my eye twitch of course). I’m still only drinking one (large) cup of coffee per day (most of the time). I haven’t thrown myself into a stress-induced ice cream binge (yet), I’m still fitting in all of my workouts, and I must be doing SOMETHING to keep my cortisol levels in check, because my belly hasn’t blown up like a balloon like it usually does when I’m super exhausted. In fact, I’ve been noticing a little more definition in the abdominal area than usual. Now I’d let to get something straight here. I’ve never had visible abdominals or anything like that. It’s not something I’ve ever aspired to have and to be honest, I figured it was something I would never have. The visibility of your abs is dependent on a lot of things, one of them being the structure of your body. Ever notice how some people have some extra padding on their stomachs and still have visible abs? And how others look super lean and yet don’t have any definition in the abdominal area? I’m not saying I’m super lean, because I’m not. But I know I’m fitter than the average bear, and unless I stand with my body twisted and contorted, until recently there was never even a hint of definition on this tummy. I get asked about abs a lot. So today I’m here to clear things up once and for all. I’ve created a step-by-step guide to achieving the abs I’m being asked for. Are you ready for this? I’ve even created an image you can print out, share with friends, keep with you at all times for motivation, whatever you need to do. In all seriousness though. 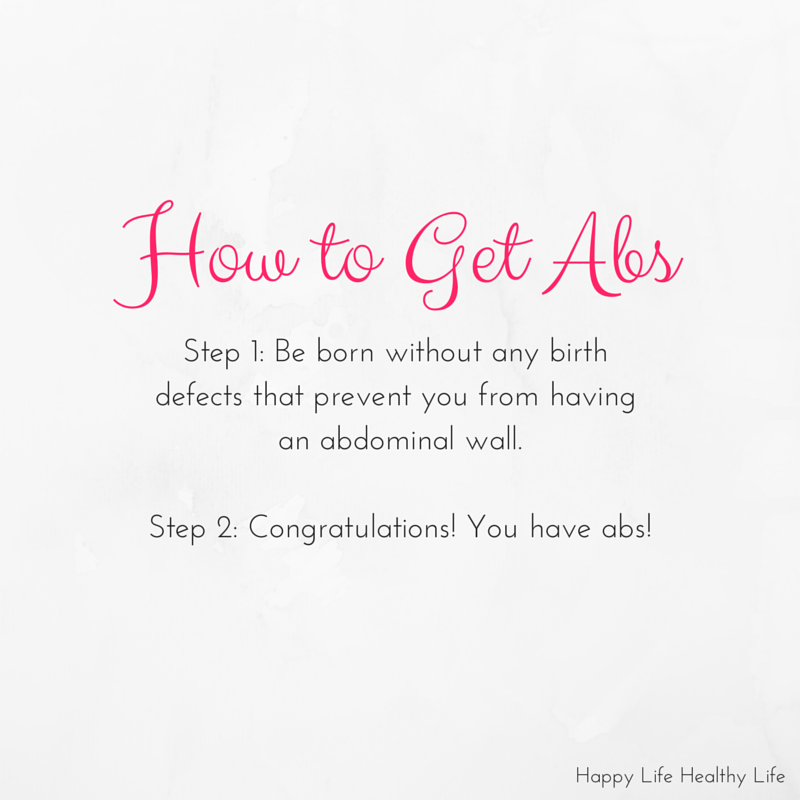 You HAVE abs! They may just not be visible! And they don’t need to be! To some they may be aesthetically pleasing, but having visible abdominal muscles is not an indicator of good health. Because of the whole “individual body structure” thing I mentioned above, some might have to go to extremes to get their body fat low enough for their abs to become visible. Likewise, those with a higher percentage of body fat and some abdominal outline visible may still be at risk for weight-related diseases. A six pack is no more a sign of good health than the ability to run a marathon is. Yes, a person who is healthy can have a six pack, and yes, a person who is healthy can run a marathon, but there are unhealthy ways to achieve both outcomes. Implement some lifestyle habits that promote a healthy body composition. Not only will you feel good and develop a lifestyle you can maintain, but as you stick with it you may notice over time that tummy of yours becomes a little more defined. Like I did. Eat a diet that’s rich in whole foods. Eat enough fats to support your hormone health, and consume enough carbohydrates to fuel your activity levels. Ensure you’re taking in enough protein to support the growth and maintenance of lean muscle tissue, which will help you burn more calories even when you’re just lounging around. Lift heavy weights so you can build said muscle. Exercise at a level that’s intense for YOU. Don’t feel the need to do hours upon hours of cardio to burn fat, and for goodness’ sake stop doing endless crunches to get a six pack! Stay active outside the gym – walk, ride a bike, or do something fun like ice skating. Practice discipline with your eating habits, but don’t be so restrictive that one tiny meal “off plan” sends you into bloating oblivion. Skip the office donuts you see every day, and instead enjoy a specialty donut from a local bakery free of guilt when the opportunity arises. And finally, slow down and relax. With the fast-paced world we live in it’s always “go go go no time for sleep”. I admit I am 100% guilty of this, but I notice that whenever I do manage to keep those cortisol levels in check by getting a good night’s sleep and taking a chill pill, I wake up feeling a bit less bloated. THAT is how you get healthy. And while it may or may not result in you “getting” abs, it WILL result in you feeling like a whole lot of awesome. So what are your thoughts on all this? Are you, or have you ever, been one to strive for a ripped six pack? Could you care less? Any tips you’d like to share that promote a healthy body composition? This entry was posted in Fitness and tagged balance, diet, exercise, fitness, goals, health, personal training, strength training, sweat pink, vancouver, weight loss. Bookmark the permalink. When the email popped in this morning, I almost didn’t read it. I didn’t want to read it. “How to get abs” didn’t sound like the Ariana I know and appreciate. And then I read it, as I always do, because I know and appreciate Ariana. And there it was. I have abs, you have abs, we all have abs! Awesome post, Ariana, as always! Hilarious post! It’s funny how some people are just naturally born with defined abs and some never will, despite their best efforts. If such a thing were possible, I’d totally give you the snow that’s supposed to fall here! :]! I have a countdown to 30! I’m very focused on this! I hope to lose 30 lbs. I guess then I’ll find out if abs are possible.